You'll love the user-friendly components that make up our new UltraPro components line. All the components, except the tee cover, are made with bands. No more rivets and screws to fumble with. Also, we've combined the storm collar, top clamp, and top plate into one component. We call it our CollarPlate. On top of that, so to speak, we've created a great new CollarPlate Rain Cap that is just plain better than any other kit rain cap you can buy. 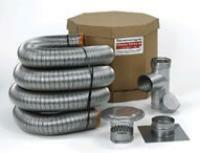 HomeSaver made their UltraPro liner more flexible without compromising the excellent HomeSaver strength we chimney professionals have known. They've improved their components to make them a snap to use and, we've managed to lower the price of our UltraPro pipe and components. Build your own kit from the components listed below. Download the installation instructions to see what you will need for installation. Do not forget the insulation. You need insulation to achieve the UL Listing of 1777 Standard. Besides, insulating improves draft and cuts down on creosote formation. This will be an installation that will last a lifetime, it's best to do it right the first time and be done with it. Read more about HomeSaver UltraPro on our information page. Precut 25' HomeSaver UltraPro 6"
Precut 20' HomeSaver UltraPro 6"
Connector-Adaptor with 2 Bands; HS Pro 6"
Precut 30' HomeSaver UltraPro 6"
Precut 35' HomeSaver UltraPro 6"
Connector-Adaptor with Band; HS Pro 6"
Order 10% more than your measurement. Tee Uncrimped Take Off with Band; 316-SS; 6"
Tee Cover; 316 Alloy SS; 6"
Tee Connector; Heat-Fab 24GA Black 6"
6" Top Plate - 9"x13"
6" Top Plate - 13"x13"